Loans and grants are being made available to small businesses as National Grid said Monday that 95 percent of its customers have had their gas service restored, a week after a failed valve in a transmission line caused a drop in pressure, necessitating a shutdown of most low-pressure gas service in Newport and neighboring Middletown. “It is very important that we send the message out that Newport is still open for business,” said Mayor Jamie Bova. The Rhode Island Commerce Corporation is marshaling $1.45 million in funds advanced by the Rhode Island Foundation and Bank of Newport, said Gov. 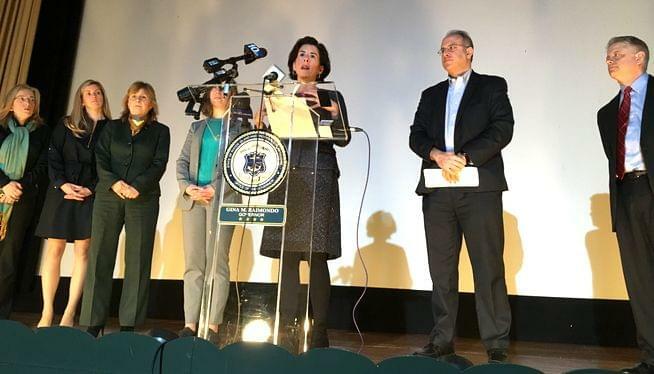 Gina Raimondo, while the utility, which is based in the United Kingdom, said it will offer $500,000 in grants to small businesses. “This has not been easy for small businesses,” said Gov. Gina Raimondo. “Being without a week’s worth of revenue is very difficult,” she said from the stage of the Jane Pickens Theater. “Our pledge is that we will work as hard as we can to respond to an applicant with a completed file within two business days,” said Commerce Corporation Secretary Stefan Pryor. He said applicants can come in, beginning Tuesday to the Newport Gateway Visitors Center on America’s Cup Avenue, or call 401-521-HELP for information. 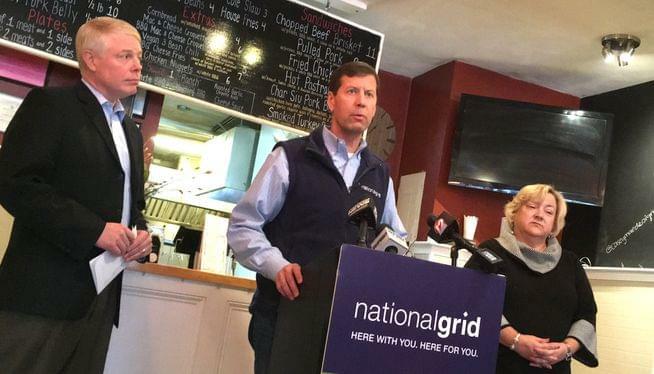 Hours after the governor’s announcement, National Grid said it would establish a program of grants to small businesses. “It’s going to be a nimble and quick setup with an online application that we’re working through right now that will be available this week, with the first payments for the grants program to be issued next week,” said Tim Hornan, National Grid Rhode Island President. Horan has been out of action since hours after the gas emergency began when he collapsed at a briefing and was hospitalized, ostensibly for fatigue. “It’s been a challenge for me to be away for a week, as I really care for our customers and our employees and everyone involved,” he said in a restaurant on Broadway, Binge BBQ, which was hired by the utility to help feed hungry Newporters at feeding centers. “I’m back and I’m glad to be back,” Horan said. National Grid said it would close its customers center at Gurney’s Newport Resort at Goat Island on Monday night, and would maintain customer centers beginning on Tuesday at the nearby Newport Gateway Visitors Center and at the Middletown Police Station on Valley Road.